Madeira is a fortified Portuguese wine made in the Madeira Islands. MADEIRA is produced in a variety of styles ranging from dry wines which can be consumed on their own as an aperitif, to sweet wines more usually consumed with dessert. Cheaper cooking versions are often flavoured with salt and pepper for use in cooking but these are not fit for consumption as a beverage. The islands of Madeira have a long winemaking history, dating back to the Age of Exploration when Madeira was a standard port of call for ships heading to the New World or East Indies. To prevent the wine from spoiling, neutral grape spirits were added. On the long sea voyages, the wines would be exposed to excessive heat and movement which transformed the flavour of the wine. This was discovered by the wine producers of Madeira when an unsold shipment of wine returned to the islands after a round trip. Today, Madeira is noted for its unique winemaking process which involves heating the wine. The wine is placed in stainless steel vats that are heated via a serpentine method. Hot water, at a temperature between 45 and 50 degrees Celsius runs through this serpentine system for a period of never less than three months. Once this heating process (“estufagem”) is completed, the wine is subjected to a rest period (“estágio”) of at least 90 days in order to acquire the conditions that will make it possible for the oenologist to finish the wine so that it may be placed in a bottle with the required quality guarantee. These wines may never be bottled and commercialised before the 31st October of the second year following the harvesting and are typically batch wines. Because of this unique process, Madeira is a very robust wine that can be quite long lived even after being opened. Immortal beloved: madeira wine is a taste of history - The Telegraph. Mad about MADEIRA - "The world's most breathtaking wine." MADEIRA WINE reviews, Ratings & More - Wine Enthusiast Magazine. Portugal's Poldarkian wine: why Madeira is a must for Christmas - The Telegraph. Top 25 Portuguese Madeira wines right now - Vivino. Vinho MADEIRA - "Welcome to Madeira Wine." Blandy's - the leading premium Madeira wine producer, established in 1811. COSSART GORDON - "The Oldest Shippers of Madeira Wine Established 1745." Part of the 'Madeira Wine Company'. BLANDY'S - established 1811. This is the oldest Madeira wine company. H. M. Borges - established 1877. Henriques & Henriques Vinhos - established in 1750. Justino’s Madeira Wines - established 1870. The biggest wine company, produces 49% of all Madeira’s. MILES - formerly Rutherford and Brown, dating back to 1814. Pereira d’Oliveira - established 1820. 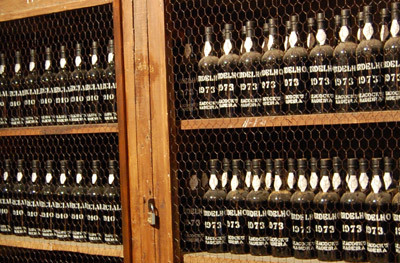 Possesses the largest stock of very old Madeira’s. Vinhos BARBEITO - since 1946. The youngest Madeira wine company.